Patola Silk is expensive. Period. The range for Salvi Patola Sarees can start from a lakh to upwards of 2-3 lakhs. You can, however, get other Patola sarees for a lot less. Whether it is for Indian weddings or any other special occasions, you can .never go wrong with a patola saree. In today’s post, we will look at Ayush Kejriwal Patola Sarees. It’s a refreshing feeling to see Indian sarees trending yet again. I see a lot of brides choosing a saree over lehenga, and I couldn’t be happier. You see a lehenga is a one-time affair. An Indian saree has the potential to become an heirloom piece. Patola Sarees Ayush Kejriwal is some of the best in the business. If you are looking to score some gorgeous silks for your wardrobe, then you must check out Ayush Kejriwal Patola Sarees. There are so many different styles of an Indian Saree. Even I am currently educating myself. Every state has its own speciality from silks like Kanjeevaram, Banarasi, to Paithani, Kalamkari, Chiffon and Patan Patola. The list goes endless. Patola Silk comes from Gujarat. It is traditional handloom silk which originates from a small place in Gujarat called Patan. Now, you know why patan patola sarees are the crème de la crème of Indian Silk Sarees. From the moment Ayush Kejriwal launched his collection back in 2014-2015, he has brought the focus back on Indian textiles. Every single piece in his collection is a worthy investment. Plus, Ayush Kejriwal is probably one of those few designers whose collection will drive you insane just trying to pick a favourite. In the beginning, I thought, let me share ALL of his saree styles in one post. But it just didn’t do justice because there is so much to say about his work. So today its all going to be about Ayush Kejriwal Patola Sarees. Rulavati is a double ikkat patola silk with a striking black base alongside bright red, orange, yellow, turquoise, white and green. It has the most stunning motifs including leopards, elephants and peacocks. Patan is only one of three regions in the world that produce double Ikat fabric, the most complicated of all textile designs, Tenganan village in Bali and Okinawa in Japan being the other two. Amongst these, Patan alone enjoys the pride of weaving the longest measure of the material – a divinely beautiful 6 yards of unyielding labour! Double Ikat Patola from the area of Patan in the North Gujarat region of western India glorifies this heritage. With its unique gems like qualities-gorgeous colours, designs and durability. Its very appearance lures the connoisseur of fine textiles. It has no reverse side. Both the sides have an equal intensity of colour and design. The peculiar quality has its origins in a very intricate and difficult technique of Tie-dyeing or Knot dyeing known as “Bandhani Process” on the wrap & weft separately before weaving. Before World War II, Indonesia was the major buyer of patolas. Historically, the art of Double Ikat patola weaving dates back to centuries. Paintings in Ajanta caves resemble the tie-dye technique of patola. Legend indicates that sometimes in the 12th Century AD, King Kumarpal of Solanki dynasty invited 700 families of patola weavers from Jalna (South Maharashtra) to settle down in Patan in North Gujarat. Salvi family is one of them who has continued this traditional art and has preserved it even today. This is our heritage art since the 11th century (Approx. 35 generations). What is the process of making a Patan Patola Saree? Even when a single thread is displaced, the resulting design would be warped. That’s how complicated a patan patola saree is. The process of producing a patola piece is extremely time-consuming, requiring a blend of mathematical precision and creativity. The design to be woven is first drawn on graph paper and then copied onto the yarn. Narikunjar, ratanchawk, phul bhat, butta bhat, navaratna are some of the most popular patola patterns but changing times bring with them contemporary flavours. What does Ayush Kejriwal Patola Sarees look like? Featured here is the stunning ‘ Pyaripia’ jhumka that goes so flawlessly with the Ayush Kejriwal Patola Sarees. What are the different colours in Patan Patola Saree? The time-consuming but highly skilled tying, untying, retying and dyeing in different colours of a Patola saree can take several months. Loud red, yellow, green and blue dominate the patola sarees. The pattern becomes apparent as warp threads set on the loom. Traditional motifs are called bhat and include narikunjar, paan, choktha (square), chhabadi (10 elephants), laheriya (diagonal lines) and navratna (nine gems) among others. The striking colours in the Patola sarees remain intact for centuries as all colours are sourced organically. Turmeric, marigold flowers, onion skin, pomegranate bark, madder root, lac, catechu and indigo along with different mordant (use of chemicals to bind natural dyes to the textile fibres) are used as a dye. The magic of a Patola is undeniable. A rather happy sunshine yellow patola silk base with touches of pink, orange and offwhite. When I design I always have an image in head. Independent women who are sure of themselves and very comfortable with their body. Someone who is not bothered about trends or follows celebrities or magazines to decide what becomes a part of their wardrobe. Women who are fierce but at the same time very feminine. I see women who are confident and unaffected with opinions people may have of them. A beautiful chilli red, orange and burnt yellow patola teamed with a floral blouse and finished with a golden lumpi. I love the two duck image on this saree it’s very unusual and striking. What sort of Jewellery goes well with Ayush Kejriwal Patola Sarees? The ‘Tota’ haar teamed here with the ‘Aarokhi’ Patola saree and some colourful glass bangles. You can additionally also purchase jewellery from Ayush Kejriwal. If you are into antique oxidised statement jewellery pieces, his collection will make you smile. He has some really good neckpieces and earrings that you must check out. Why are these Patola Sarees so expensive? Patola means “Queen of Silks”. The Patola Silk Sarees are one of the finest varieties of handloom silk saree from Gujarat. Patola sarees are woven with great clarity and precision. They are well known all over the world for their highly delicate patterns. These sarees are woven by master weavers on a special type of silk called ‘Patola Silk’. Geometric designs with folk motifs and flaming colours are characteristic features of Patola Sarees. Each Patola saree reflects the skill and imagination of the weaver and is exclusive by nature. Patan and Surat are famous destinations of Patola Sarees. Patan, the place in Gujarat, is well known for its Patola saree. This costly and high status oriented Patola sarees were worn by the Vohras and well-off Jains and Hindus (Brahmins and Bhatia traders) for weddings and other propitious occasions. The sarees became a symbol of status and part of wedding brocade dresses and from then on, are regarded as best pure silk bridal wears. Patola sari is a lifetime investment that endures for over 100 years! Besides the unique feature of the double ikat weave, the finished cloth is identical on the obverse and reverse. What is the Price of Ayush Kejriwal Patola Sarees? Last I checked, Ayush Kejriwal saree collection price started upwards £160 ~ INR 14000. This was back in 2016 and I’m talking prices of regular sarees. Unfortunately, I don’t have a number per say to share with you here for Ayush Kejriwal Patola Sarees price. You will need to contact the designer for individual prices. However, from what I know, his designs are not astronomically expensive. You pay in the same range (or maybe a tad bit more) as compared to buying any other silk saree from stores. My point being, don’t shy away from reaching out to the designer. His primary mode of contact for any purchase queries is through WhatsApp and Email. I have interacted with the designer once and he is a down to earth person to connect with. Mind you, don’t hound him with ‘PP’ (price please) unless and until you are really interested in scoring an Ayush Kejriwal Saree. 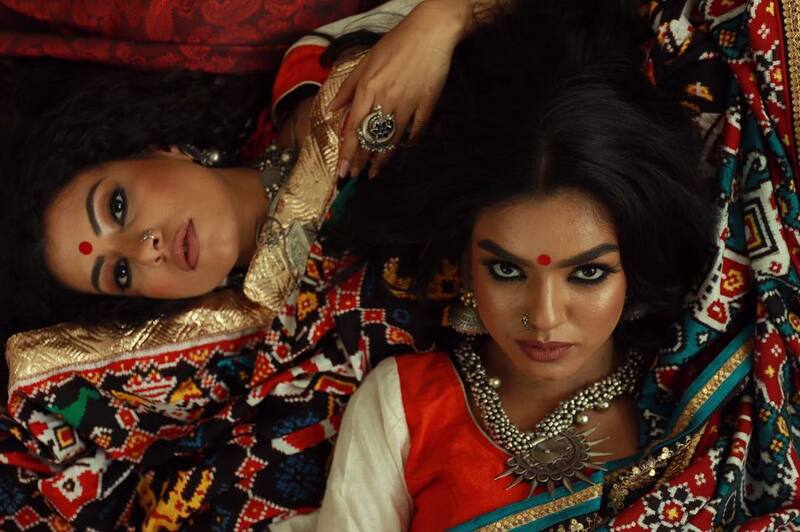 Ayush Kejriwal is based out of UK, Glasgow but he ships his designs worldwide. Some of his major clients are based out of US & India. Ayush Kejriwal Label ships worldwide.